The West Coast has a long golfing history and is proud to offer The West Coast Golf Challenge, a great experience for both local golfers and friends from ‘away’ – which is every part of the world that is not on ‘The Coast’. March 5th - March 8th 2019, will be the 7th edition of the West Coast Golf Challenge. It is a great opportunity to combine four rounds of golf on four quite different courses with the chance to experience some of the most beautiful scenery in the country. The four hosting clubs are Westport on their Kawatiri links at Carters’ Beach, Reefton on their Glenburnie course, Hokitika on their links course at Mahinapua, and Greymouth on their course at Kaiata. Visitors are encouraged to take time either before, during or after the tournament to visit picturesque landmarks such as Denniston, Cape Foulwind, Charleston, Punakaiki, Oceana Gold mine, Lake Brunner, Brunner Mine, Shantytown, Lake Kaniere, Hokitika Gorge or The Glaciers and all of the beauty that lies between and beyond. The chance should also be taken to be impressed by and get your own examples of the wonderful art and crafts that the West Coast prides itself on. A good variety of accommodationand restaurants are available in all of the towns and visitors can choose to relocate for the next day’s play, which the schedule readily allows for, or make any of the towns their base for the duration of the tournament. 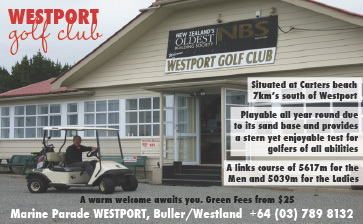 The courses will be played in the following order, Westport, Reefton, Hokitika and finally Greymouth. Tournament organisers are confident that visitors and locals alike will be impressed with the $14000-plus value prize list. The tournament will be a stableford in three divisions, one for women and two for the men. With fields over 100 in the last two years we expect the limit of 120 players to be reached fairly quickly so enter early to avoid disappointment. To express interest and receive an information pack, or visit the tournament website at http:// westcoastgolfchallenge.com for more informationand an entry form. Send your entries to Brian Hampton at brian.hampy@outlook.com or post entry and cheque payment to West Coast Golf Challenge C/o Brian Hampton, 15 Main Street, Reefton 7830. Entry is confirmed on payment. The club began playing on this course, the Glenburnie course, in 1960, having been previously sited at Waitahu and prior to that, in the centre of the Reefton Race Course. The course has twelve holes, with holes 1-6 also being holes 13-18, although with different tees. Course is a par 72 and 5511 meters. Green fee players and visitors most welcome to play and enjoy the views. Green fees are set at $20/day. Club days are Sundays. The course is open all day, every day, with the greens mown twice weekly. Although there is a small club membership of 40 the high standard of the course is completely achieved through voluntary contributions of time. We have two main tournaments each year, the first at Queen’s Birthday weekend and the second being the Inangahua open which is held in November each year and over 2 days, each of 18 holes. Club members are proud to be part of the West Coast Golf challenge. Golf Course is set on the banks of the Inangahua River and is the centre for farming, gold, coal and forestry. The town of Reefton has a population of about 1000 people, with some very good accommodation in hotels and motels. Any more info on Reefton golf please contact the club on 03 7328 575 (clubhouse) or 0273100500 Murray Rennie); or email reeftongolf@gmail.com as clubhouse is only manned on Sundays.